Frequently Asked Questions - Tahor - Pure & Simple. Download Tahor App For Free! Below you will find the answers to the most common questions about Tahor App. if we’ve missed anything or you have another question, please don’t hesitate to contact us. When should I use Tahor App? 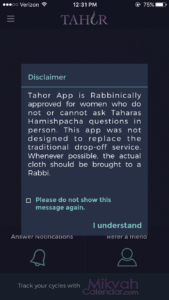 If you cannot ask your rabbi a question in person or if you generally don’t ask Taharas Hamishpacha / Niddah questions, you can use Tahor app to immediately connect with a Taharat Hamishpacha Expert to determine whether your question is Tahor or not. Which phones work with Tahor App? How does Tahor App's Color Calibration Technology work? Tahor App has been fortunate enough to have David Silver, a color calibration engineer, develop this technology. David, a frum Jew, graduated from the Technion and worked for both Apple and Google. Essentially, Tahor’s color-calibration technology works as follows: 1. The user takes a picture on a white background. 2. The user must then drag a small “calibration box” over the white backround. 3. Every color has a numerical value with “white” being a zero. Once the color-calibration program can establish a base color (in this case the white at the numerical value of zero), the program then augments the photo and restores it to its proper numerical value irrespective of the environment in which the picture was taken. So, for example, say you took a picture in an environment where there was a slight yellow hue that adds a numerical value of “three” to all colors. In such a circumstance, the program would recognize that the white background which should reflect the numerical value of zero now reflects the numerical value of three. This allows the program to determine which numbers must be eliminated. Once the program can target the numbers (which precisely correspond to specific colors, in this case, the yellow hue) that must be eliminated, the program subtracts the numerical value and its corresponding color from the picture, thereby restoring what the photo would look like in an ideal environment without the influence of the yellow hue. It’s a complicated program, which is why Tahor app has been fortunate to benefit from David Silver’s expertise. What’s more incredible is that David Silver developed this technology “lishma.” Meaning, he did not charge Tahor app for his service, as he shares our perspective that Taharat Hamishpacha must be available to everyone as cheaply and conveniently as possible. Thank you David Silver!! What kind of questions can Tahor app answer? The majority of questions received by a Rabbi are clearly pure or impure. In such circumstances, it is very easy to make a psak from a picture. However, there are instances when the stain is more questionable. 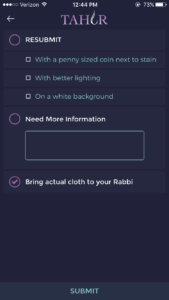 In such an instant, the responding Rabbi on Tahor app will choose from the following options (pictured below) and instruct the user to take the question to an actual Rabbi. How does Tahor App work? Simple. Follow the easy step-by-step instructions to take a picture with our Rabbinically-Approved camera technology and hit send. You will receive an answer shortly. Does Tahor App help Rabbis determine a psak? Yes! Thanks to Tahor app’s anonymity, women can now provide additional personal and medical information that has not necessarily been available in the conventional “drop- off” service. This does not mean that we encourage replacing the “drop-off” service. It means that even with an app, women can provide halachically pertinent information to a Rav. How is Tahor App anonymous? Any image or correspondence sent to a Rabbi through Tahor App has absolutely no identifying information. The Taharat Hamishpacha Expert will only see the picture of your question along with any accompanying text you provide. Why does Tahor App exist? Tahor app was created to help women who cannot or do not ask Niddah questions. It is our belief that adding anonymity and convenience to this mitzvah will encourage women to participate in Taharas Hamishpacha. Tahor app can also help women who are in need of a psak in a short period of time (such as due to fertility treatments). Does Tahor replace the relationship with my Rabbi? No. Your Rabbi may even be a Tahor app responder! However, we encourage you to continue asking questions to your Rabbi in person, if possible. What if my picture isn’t clear and doesn’t receive an answer? There may be a situation when the Taharat Hamishpacha Expert can’t answer the question due to lack of picture clarity. In such a case, you will be instructed to resubmit your picture. If the Rabbinic Expert finds it necessary, he might tell you to take your actual cloth to a Rabbi. Is a picture accurate enough for a psak? Generally, yes. Tahor app uses technology that has been rigorously tested by many Rabbonim and received Rabbincal approval. Tahor app will prevent you from taking a picture in an environment that will compromise the integrity of the image. Additionally, before you send your picture, the app will ask you whether the picture is accurate. If it is not, there are more tools to help you achieve a better photo. If the picture is still not perfect, you can choose not to send the picture. Moreover, once the Rabbi receives the question, if he cannot determine what the psak is, he will instruct you to either send a new photo or bring your cloth to a Rav, if possible. Why do I need to include a coin with my picture? Stain size affects the psak. Placing a coin near the stain allows the Taharat Hamishpacha Expert to reference the coin to scale the stain. Additionally, Tahor app provides the responding Rav with a tool to trace the coin, move the traced outline and place it over the stain. The Rabbi can then reshape the outline to hug the borders of the stain to see if the stain is a “gris” or not. No matter how the Rabbi reshapes the outline, it will remain consistent and maintain the same surface area of the coin. Has Tahor App been tested by Rabbis? Yes. The creators of Tahor app have rigorously tested the functionality of Tahor app with many Rabbis. Can my Rabbi become a Tahor App responder? Of course! Ask your Rabbi to contact us at info@Tahorapp.com so we can set him up to be a Tahor responder. The Rabbonim know how important it is that you receive an answer as soon as possible. They should respond within a few hours excluding Shabbat and Jewish Holidays. There are many opportunities to get involved. For example, writing an article about how Tahor app has helped you would really help let others know about this great service. To learn more, please contact us at info@tahorapp.com. How long will my questions stay in my History? Your questions will remain in your History for 7 days. You can also delete your History by clicking the “trash” icon. Who are the creators of Tahor App? Rivkah Bloom, the creator of MikvahCalendar.com holds a BS and MEng in Computer Science from MIT. Yitzhak Levin, Esq. obtained Smicha while in Flatbush and is currently a practicing attorney. Zisa Levin, received a BA in Judaic Studies and Business and an MSW from Wurzweiler School of Social Work. 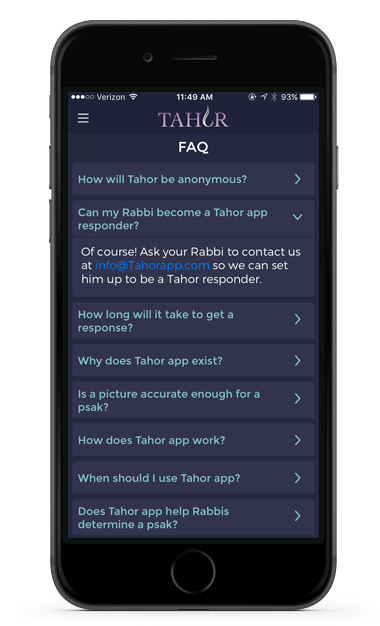 Together, we built Tahor app with the help of prominent Rabbonim to provide women with an anonymous and discreet way to receive answers to their Taharatat Hamishpacha questions.